I don’t know of too many families that say they sit down and watch documentaries together, but I do know plenty that watch reality shows on TV, and this title is for them. Bee People looked like a film that was going to tell me more about something that I already know: that honeybees are in steep decline, and that anyone who appreciates the little things in life (like flowers, fruits, vegetables . . . trees) ought to be worried. In other words, I expected a documentary with the usual blend of voiceover narration, “bee-roll,” and talking heads. 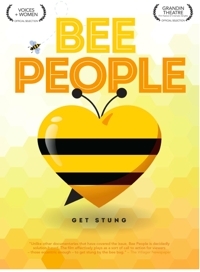 We get some of the information, but really, Bee People comes closer to a reality show like Treehouse Masters, where you follow an amiable and fun-loving expert (or two) as they go about their business—in this case, answering calls to remove beehives from unwanted locations, relocating “swarms,” establishing new hives for people willing to host them, visiting schools and conventions, mentoring new beekeepers, and shadowing other bee people to see how they do it. Like many parents, my wife and I have tried to help our children to develop an appreciation for a broad range of things, whether it’s expanding their palette at home or their sense of the world via travel. 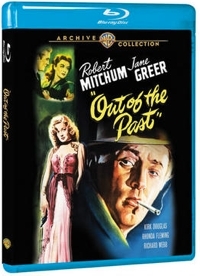 It would be nice, too, if that appreciation extended to film—though this generation seems more resistant to black-and-white movies made in the old Academy ratio (1.33:1) instead of widescreen, and put off by films that are dialogue and plot rich, rather than action-filled visual blockbusters. So this was an experiment. I told them the 20-minute rule was in effect—give Out of the Past a chance, and if they hated it after 20 minutes I’d put on something else. Film noir is so important a style that I wanted them at least to be able to recognize the traits: the emphasis on shady characters with shady pasts, the frequent flashbacks, the manipulation of shadow and light to create stylized effects, the rough-talking hero who often narrates his own story, and the femme fatale he’s drawn to, even though she’s bad for him and could get him killed. Pixar takes the same kind of pride and care with their Toy Story characters as Walt Disney did with his beloved Mickey Mouse. Whether it’s a major motion picture, a half-hour TV special, or one of the short Toy Story Toons to come out of Pixar Canada, the quality of animation and the level of creativity is consistently superior to the competition. I know. What competition, right? 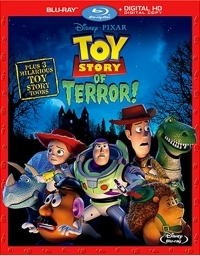 Toy Story of Terror is a perfect example. This 21-minute Halloween special debuted on ABC-TV on October 16, 2013, but it stars all of the original voice talents and features the same energy, inventiveness and attention to detail as we got in the three big Toy Story movies. What’s more, with this release the Pixar bunch continues with their playful brand of self-reflexive filmmaking. This time we pick up the action as Woody (Tom Hanks), Buzz Lightyear (Tim Allen), Jessie (Joan Cusack), Rex (Wallace Shawn), Mr. Pricklepants (Timothy Dalton), Mr. Potato Head (Don Rickles), and Trixie (Kristen Schaal) are using a portable DVD player to watch a horror film in the trunk of young Bonnie’s car. Her mother is taking her on a road trip, and as the toys watch horror in horror, Mr. Pricklepants narrates, anticipating the action by exposing all of the conventions of the genre in a sardonic running commentary. 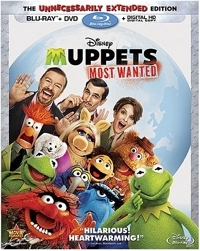 With The Muppets (2011), Disney breathed new life into a near-dead franchise by infusing it with self-reflexive jokes and getting back to the clever writing, memorable songs, and manic energy that made Jim Henson’s marionette-puppets a hit in the first place. If the previous Spider-Man trilogy and the new Amazing Spider-Man trilogy-in-progress (yes, a third installment has been announced for 2018 release) were tucked inside a time capsule with instructions for researchers to divide a test audience into two groups and show the trilogies one after the other, would their favorite depend on which one they see first? Maybe. Both trilogies are comparable blockbusters with slick special effects, charismatic casts, and airtight screenplays that follow the Marvel handbook pretty closely. But there are some differences. In Sam Raimi’s 2002, 2004, and 2007 films, Tobey Maguire was a bit of a nerd as Peter Parker, and his superhero adventure played like a coming-of-age story. The series was campy, too, deliberately going for a playful tone to bring it in line with the comic book world. 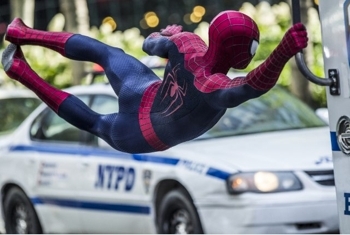 That world has grown darker, though, and in the 2012 reboot from director Marc Webb, Andrew Garfield was a little edgier than the doe-eyed Maguire, more skate punk with attitude than an innocent teen, and in this new series Gwen’s father’s objections to him are more intense (and justifiably so). It’s the same in The Amazing Spider-Man 2. 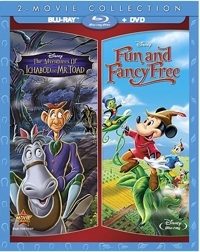 The Adventures of Ichabod and Mr. Toad and Fun and Fancy Free are being billed as a 2-Movie Collection, but this release could just as easily have been called a 3-Movie Collection. Also included is The Reluctant Dragon, completing a Disney trifecta of 1940s animated shorts that were stretched or cobbled together to create full-length features. The film that most naturally fills the space is The Adventures of Ichabod and Mr. Toad, which is really a pair of literary adaptations: one a retelling of Washington Irving’s famous Halloween story of the headless horseman, “The Legend of Sleepy Hollow,” and the other a film version of Kenneth Grahame’s “The Wind in the Willows.” With Bing Crosby narrating and doing a bit of crooning as well, “The Adventures of Ichabod Crane” still stands as one of the best versions of Irving’s famous tale. 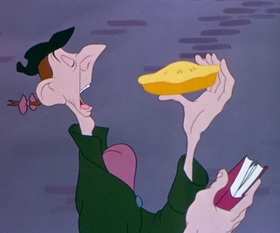 The way that Ichabod is rendered makes him a humorous figure with almost every move he takes, and that establishes a comic undertone that makes the frightening chase at the end a little less traumatic for young viewers. It’s Disney, it has magic in it, but for me it would be a stretch to call Bedknobs and Broomsticks magical. Hollywood has a name for when studios try to capture lightning in a bottle twice. It’s called a “sequel,” and at times this 1971 blend of live action and animation feels like one, or a throwback to Disney features like The Love Bug. That said, this film has a dedicated bunch of fans that will be tickled to get it on Blu-ray, finally, and nostalgia is a powerful draw. Still, how you respond to this film most likely will depend upon your age and whether you’re a fan of Mary Poppins. Why? Because critics and audiences have compared the two from the beginning, and not without cause. Mary Poppins, which played in theaters seven years earlier and was as big of an event as Hollywood had seen, received 13 Oscar nominations and won for Best Actress, Best Editing, Best Song, Best Score, and Best Special Visual Effects. 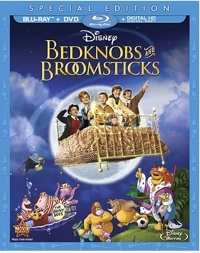 Meanwhile, Bedknobs and Broomsticks earned five nominations and only won for Best Special Visual Effects.